Compiled by Maureen E. Wilks, 2005. New Mexico Geological Society and New Mexico Bureau of Geology and Mineral Resources, 1 double-sided field-durable sheet containing text and figures, scale 1:1,000,000. The New Mexico Geologic Highway Map is published jointly by the New Mexico Geological Society and the New Mexico Bureau of Geology and Mineral Resources. 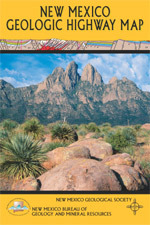 In addition to the geologic highway map (1:1,000,000), the single sheet includes full unit descriptions, cross sections, regional stratigraphic columns, photos, and additional text material and maps on the geology of New Mexico. First published in 1982, this new edition has been completely revised and updated. You may also be interested in our larger Geologic Map of New Mexico and Satellite Image of New Mexico (both at a scale of 1:500,000).